Did you know that between 1989 and 1996 condo apartments in central Toronto lost 50% of their value? Peak to bottom, condos in South Etobicoke crashed by 40%, North York by 17%, Annex by 34% and Central Scarborough by 52%. If you adjust for inflation, those numbers are even worse! 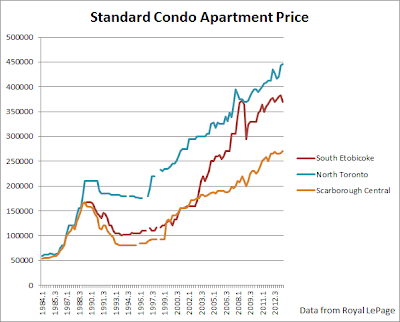 Teleport to present day and condo prices in South Etobicoke are 121% above the peak reached in 1989. 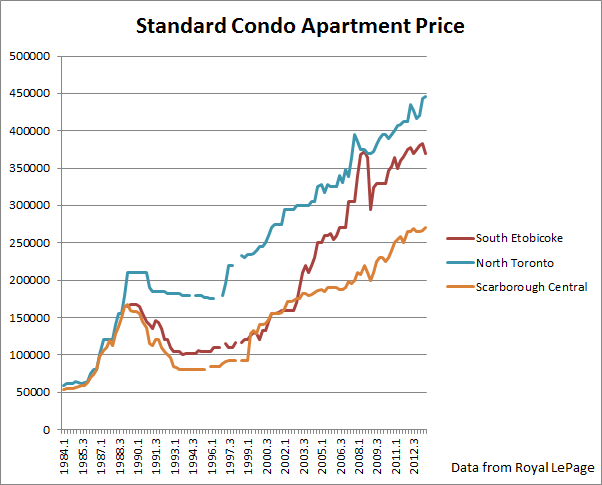 Similarly, apartment prices are up by 85% in the Annex, 112% in North York and 61% in Central Scarborough. While the above numbers may seem impressive you must realize that much of that gain was due to inflation. I didn't have time to make an adjusted for inflation version of the above graph, but the graph below should demonstrate the pattern. 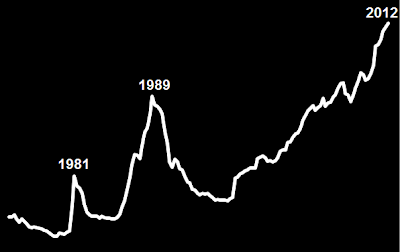 Note the chart below shows the home price index of all homes in Toronto adjusted for inflation. Clearly there was a housing bubble in Toronto during the late '80s. But do we have one today? Arguably the two largest drivers of real estate price growth are the interest rates and incomes (the third is lax lending rules). The posted 5 year fixed mortgage rate in 1989 was roughly 12%. Today that number is roughly 4%. Thing is, with a 4% interest rate you can finance twice the debt level of 12% interest rates for the same monthly payment! For example, a $200,000 mortgage at 4% would have the same monthly payment as a $100,000 mortgage at 12%. Well, real incomes in Toronto have been stagnating since the late '70s. According to the most recent data, Torontonians make ~$2,000 less per year today than in 1989. But hey, as we all know the current low interest rates are ARTIFICIAL! Remove the emergency rates and there goes the housing market (or so some say!). Who knows where the rates will be in 5 years - 12% or zero. If rates remain low it is quite possible that the housing market will inflate even further, 20% - heck even 40% (if Flaherty won't intervene). Similarly, given that the housing market depends on confidence and expectation it is possible that the market could deflate even in a low interest environment if the sentiment turns south! 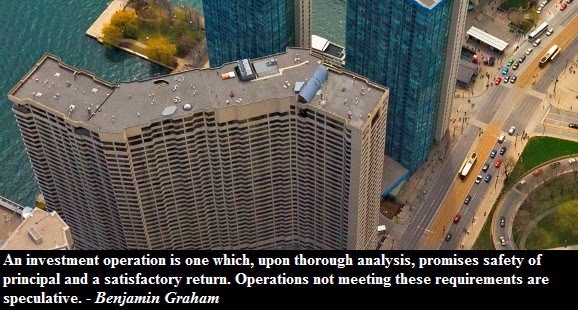 Anyhow, if one were to buy a condo today with hopes of making money with it - would that be investing or speculating?